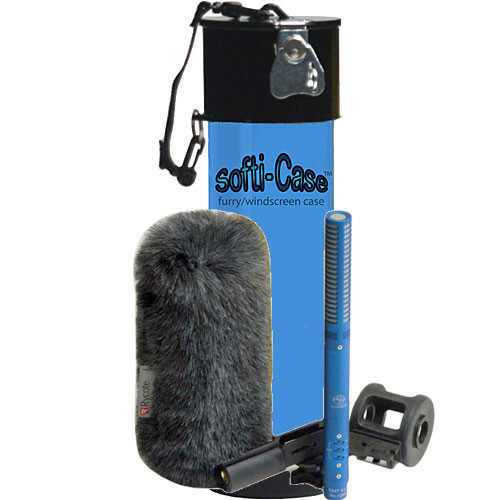 For Select Shotgun & Softies up to 20"
The Alfa Case Softi-Case, Medium (Blue) is a rigid vinyl case made for the Rycote Softie, K-Tek Fuzzy cover and other fuzzy covers. The microphone shock mount range is limited to the Rycote Softi-Mount and Lyre mount, plus the Rode PG-2 mic mount. It has a lockable draw-latch closure. Compatible with shotgun mic, softie and shockmount up to 20"
Box Dimensions (LxWxH) 24.0 x 5.5 x 5.5"
Softi-Case, Medium (Blue) is rated 1.5 out of 5 by 2. Rated 2 out of 5 by Lilli from Good and bad. This case is good for the mic-cover and the wind jammer but to small for the microphone microphone holder and boom, that is an disadvantage. Rated 1 out of 5 by Paul X from Breakable The case is OK, but it has a poor design on the cover, and broke first time I used it.